If you’re all about doing data-hungry things online, and in the meantime, you need to keep up with your business calls or to keep in touch with your family back home, this product is for you. 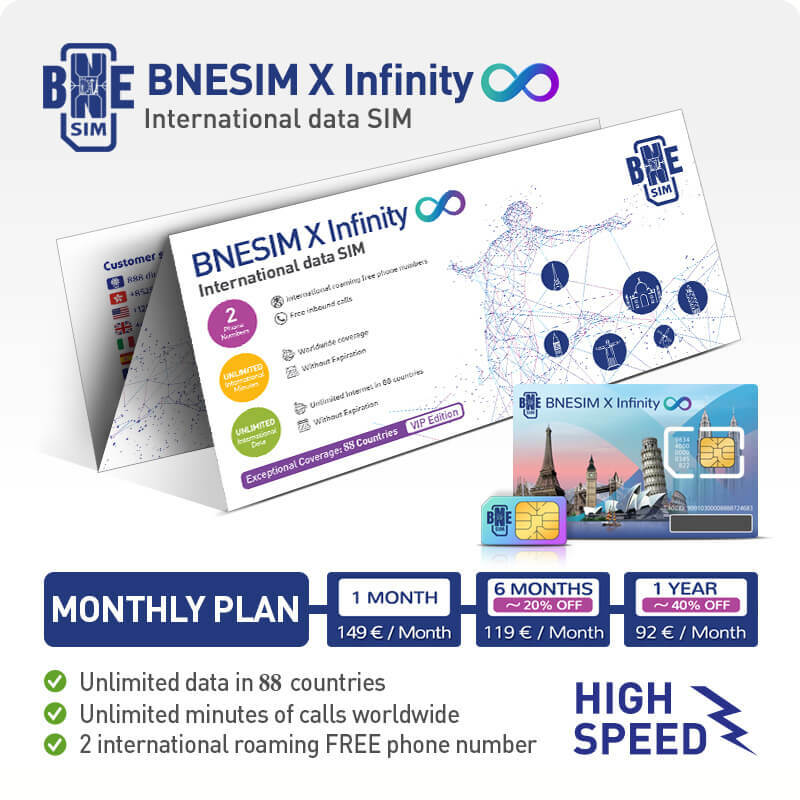 BNESIM X Infinity is the best international SIM card providing unlimited worldwide data, unlimited international calls and unlimited freedom. The freedom to use your phone overseas without worrying about your bills. Enjoy 6GB high-speed Internet per month in 88 countries and, once your full speed allowance is over, you can still use unlimited Internet at reduced speed (128Kbps). International SIM card, unlimited data, unlimited voice. Don’t you deserve to travel worry-free and enjoy your trip? Have you ever reached your destination, switched on your phone and found out that the roaming charges applied by your mobile carrier were too expensive? Have you been searching for an open shop to buy a local SIM card in the middle of the night? How many times did you give up using a local SIM because of the language barrier? Most of the travelers struggle with these questions. You’re not alone and we’re here to help. Travel the World with a single SIM card and save up to 95% on voice and data. Albania, Armenia, Australia, Austria, Azerbaijan, Bahrain, Belarus, Belgium, Brazil, Bulgaria, Cambodia, Canada, Chile, China, Colombia, Croatia, Cyprus, Czech Republic, Denmark, El Salvador, Estonia, Finland, France, Georgia, Germany, Greece, Guatemala, Hong Kong, Hungary, Iceland, India, Indonesia, Ireland, Israel, Italy, Japan, Jersey, Kazakhstan, Korea, Republic of, Kuwait, Kyrgyzstan, Latvia, Liechtenstein, Lithuania, Luxembourg, Macao, Macedonia, Malaysia, Malta, Mexico, Mongolia, Montenegro, Republic of, Myanmar, Netherlands, New Zealand, Norway, Oman, Pakistan, Panama, Peru, Philippines, Poland, Portugal, Qatar, Romania, Russia, Saudi Arabia, Serbia, Singapore, Slovakia, Slovenia, South Africa, Spain, Sri Lanka, Sweden, Switzerland, Taiwan, Tajikistan, Thailand, Turkey, Ukraine, United Arab Emirates, United Kingdom, United States, Uruguay, Uzbekistan, Vietnam. Afghanistan, American Samoa, Anguilla, Antigua And Barbuda, Argentina, Bahamas, Barbados, Belize, Benin, Bhutan, Bolivia, Bosnia And Herzegovina, Botswana, Brunei Darussalam, Burundi, Cameroon, Cape Verde, Cayman Islands, Chad, Congo, Congo, The Democratic Republic Of The, Costa Rica, Dominica, Dominican Republic, Ecuador, Egypt, Fiji, French Polynesia, Gabon, Gambia, Ghana, Gibraltar, Grenada, Guadeloupe, Guam, Guinea-Bissau, Guyana, Haiti, Honduras, Iran, Islamic Republic Of, Iraq, Jamaica, Jordan, Kenya, Laos, Liberia, Madagascar, Malawi, Mali, Mauritius, Moldova, Republic Of, Monaco, Montserrat, Morocco, Mozambique, Nauru, Nepal, Nicaragua, Niger, Nigeria, Papua New Guinea, Paraguay, Puerto Rico, Rwanda, Saint Lucia, San Marino, Senegal, Seychelles, Sierra Leone, Suriname, Tanzania, Togo, Tonga, Trinidad And Tobago, Tunisia, Uganda, Vanuatu, Venezuela, Virgin Islands, British, Zambia. Choose the yearly plan and save ~40%. Receive your SIM at home or at your destination. We deliver worldwide. and start traveling. Easy, isn’t it? Great, fast Customer Service. Friendly and helpful. Card arrived exactly in time, all three sizes and ready to go! Topups are a great feature. Would buy again. As a seafarer this is without doubt the best SIM out there. I travel around Asia in Japan, China, Philippines, Vietnam, South Korea, Malaysia, Taiwan, Hong Kong and it has worked everywhere I have been. I live in Finland and have also used the very reasonably priced data packages within the EU. The X Sim I would say is definitely the one for me but there is plenty to choose from. Support was there right away for me via the Facebook messaging page ( I was not sure about setting up APN Profile ). Thank you BNE Team and keep up the good work. If you want to save money on roaming costs people, then this is a MUST!! This is the best SIM card I have found for my travels. The cost for data is quite cheaper than other SIM cards. I love that all the credits don't expire as long as I use it once per year. You won’t lose your allowance if you don’t use it all at once. Just top up your credit once every six months to keep your account active, and your credit will continue to roll over until you’re able to use it. Add unlimited lines to your SIM. Choose your virtual phone number from 40+ countries to receive calls without roaming charges. The first number is always free and included in your SIM card. Scroll through your contacts in the BNESIM app and call or text your BNESIM friends for free wherever they are. Travel anywhere with no global roaming charges. With BNESIM there are no surprise fees or additional costs so you’ll know exactly what to expect on your bill. 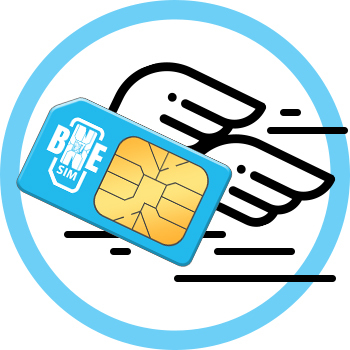 With a BNESIM travel SIM card, you can receive calls on your phone for free, without paying extra, from anywhere in the world. Our call rates are pay-per-minute and are based on the destination of the call, so it doesn’t matter from where you are calling. 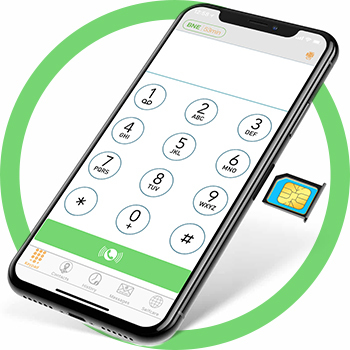 BNESIM App transforms into a virtual SIM card to receive calls even when you don’t have a SIM card in your phone. The app is also space and energy saving and will not drain your battery. Try it for free! Keep up with your emails and your social media updates with no worries on costs and coverage. BNESIM covers 170 countries with cost-effective national plans and you can surf the Internet in 88 countries at one flat rate. BNESIM SIM cards are so flexible, easy to use, and will fit your phone perfectly. All you need to do is detach the right format for your device and insert in it. 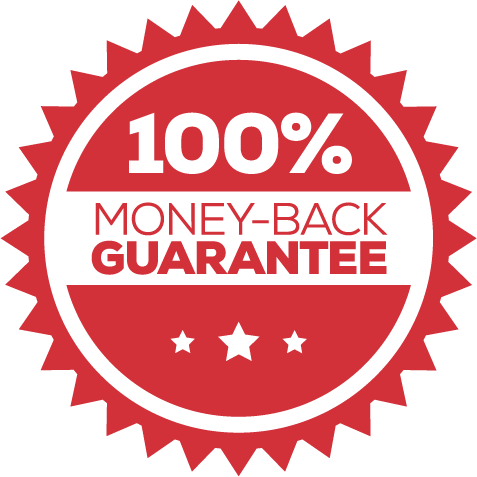 You get a money-back guarantee for peace of mind. If you are not totally delighted with your BNESIM card for any reason, you can take advantage of our Money-Back Guarantee and return it for a full, prompt, no-hassle refund.